ExxonMobil says it making multi-billion dollar upgrades to its Singapore refinery complex on Jurong Island in order to convert fuel oil and other bottom-of-the-barrel crude products into higher-value lube base stocks and distillates. "The demand for high-quality fuels and lubricants will increase as the global economy expands," says Bryan Milton, president of ExxonMobil Fuels & Lubricants Company. "By using a combination of proprietary catalyst and process technologies, we will increase the site's competitiveness and help meet growing demand for high-performance lubricants and cleaner fuels." The expansion will add the capacity to increase production of cleaner fuels with lower-sulfur content - including IMO2020 compliant 0.50% sulfur fuels - by 48,000 barrels per day. The investment will also add 20,000 barrels per day of ExxonMobil Group II base stocks capacity. The energy major says its Integrated Manufacturing Complex is home to the world's only steam cracker capable of cracking crude oil and it will be using proprietary technologies to help increase high-value product yields. Engineering, procurement, and construction activities for the upgrade have already begun, and startup is anticipated in 2023. 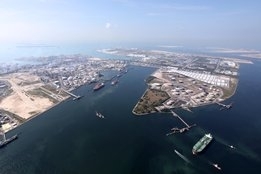 Some 15 ports to offer the alternative marine fuel by end of the year.